To connect the Model 1 to the SVD, or any floppy drive for that matter, you need to have a floppy cable connected to the Model 1 Expansion Interface. It is best to use the cable that came with the machine, but any 34-pin cable will work. If you are using the original cable, it is important to understand that each of the four connectors on the cable are "keyed." That is, some of the pins on the connector have been removed making each one specific for a particular disk drive. For example, the connector closest to the expansion interface will only work for Disk 0, and the second for Disk 1. Essentially it is the cable that is selecting the disk drive to access. If you want to load a single disk image to the SVD, simply plug the SVD into the floppy connector for floppy 0, 1, or 2. Then, using the SVD PC software, download a floppy image for the floppy drive corresponding to the connector that you plugged the SVD in to. So if you connect the SVD to the connector for disk #0, you should download a floppy image to disk #0 in the SVD PC software. Note that just like with a real TRS-80 diskette drives, one of the floppy drives on the cable needs to be "terminated". The terminated drive should be the last one on the cable (attached to the connector with the highest number). This termination can be done with a real "terminated drive" or the SVD can be the terminated drive. To use the SVD as the terminated drive, use the terminated connector that comes with the SVD. If you are using the SVD along with another real disk drive that is terminated, use the un-terminated connector with the SVD. NOTE: You must use one of the supplied connectors with the SVD. For information on these connectors, click here. A single SVD can act as two drives at one time. You can download two separate images to the SVD, and it will look like two different floppies to the TRS-80. However, for the TRS-80, this set-up is a bit more complicated. Since the normal TRS-80 floppy cable is "keyed" as described above, the SVD can't act as two different disk drives when plugged into one of the existing connectors. For example, if the SVD is plugged into the connector for drive #1, it can only operate as drive #1. To get around this problem, you can install a non-keyed connector onto the existing floppy cable. When the SVD is plugged into this connector, it can act as drives 0, 1, or 2, and can do so all at the same time. Fortunately, the SVD comes with a spare connector! This spare connector should be placed as indicated on the existing floppy cable. It doesn't really matter where the new connector is attached, although I always put it on the inside of the first connector. What does matter is that you make sure that the plastic key is on the same side as the stripe. Click on the image on the left to enlarge. With the SVD, you can boot a tremendous number of different operating systems on your TRS-80 Model 1. Here's one of my favorites shown booting here. 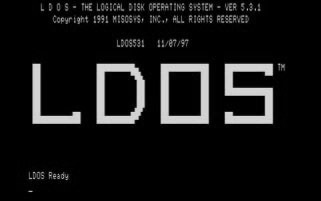 I booted LDOS by chosing it from the "Operating System" menu when I went to "Load..." one of the virtual floppies. Since the Model 1 only knows how to boot from the floppy in drive #0, the SVD needs to be connected as drive #0 in order to boot from it. Refer to the information above regarding cabling issues for the Model 1. But in general, either connect the SVD to the first keyed connector (corresponding to drive #0) or use a non-keyed connected to connect the SVD. Once you have the SVD connected, download a boot image to virtual floppy #0. This is done by clicking on the "Load..." button. For these examples I chose "List of Files" and then the LDOS entry in "Operating Systems." Don't forget to click on "Download All" to get the image transferred to the SVD. Then reboot the TRS-80. You can do this either by cycling the power or pressing reset next to the expansion interface cable. Assuming that the SVD is connected as drive #0, then a directory listing can be generated with the DIR command. If you want to look at a drive other than #0, you can place a drive number after the command as in DIR :1 to look at drive #1. Running BASIC programs (those with /BAS as an extension) require running BASIC first. Do this by typing the BASIC command to the disk prompt. Then either "LOAD" the program and "RUN" it, or just enter the "RUN" command with the filename after it. Note that different BASIC programs require different BASIC's to work. So you can't (necessarily) expect a BASIC program for the Model I to work on the Model III or vice version. Further, different OS's came with different BASIC's. So if a basic program won't work, that's probably why. Running non-BASIC programs with extensions such as "/CMD" is easy, just enter the name of the command. If you want to run a command on a different disk, enter something like PROGRAM/CMD:1 with the disk drive number at the end of the filename. The name of the backup program for LDOS is "BACKUP". Fortunately, the same name is used for TRSDOS as well. However, if you use the BACKUP program in TRSDOS (depending up on the version) you may need to use the volume password "PASSWORD" to get the copy to work. Note that the program will be smart enough to format the real floppy if necessary. Included with the SVD software is a blank floppy image that is compatible with the TRS-80. It is found in the "Operating System" selection list at the bottom of the Load screen. When using the backup programs, they will often ask you if you want to format the floppy image. You should NOT try to format the image in the SVD. Just as in the example above, the same BACKUP program is used to copy the image TO the SVD. Note that the program may try to format the SVD, but it will ask you first. Just say "no". I personally find the OS-included copy programs rather limiting. I've used the program COPYCAT to make quicker copies, or to copy otherwise "copy protected" disks from the SVD to real floppies (like Zaxxon). Note that you CAN NOT use something like COPYCAT to copy an image TO the SVD. COPYCAT does track-by-track copies, which copies sector format data as well as regular data. The SVD cannot be successfully formatted, so this will not work.